Now I'm just back from a long road trip, and I always ponder how robocars will change every type of transportation. In many cases on a road trip, you want things you don't need in a commuter or city car. It makes sense for people taking long road trips to rent temporary or exclusive use of a car designed for such road trips. One extreme of this would be the robo-RV, a full home on wheels with self-drive ability. RV travel isn't much cheaper than car+motel travel, but it offers the ability to camp in places that have no hotels (like national parks or the wilderness) and saves the hassle of everything involved in a hotel -- finding one, checking in, unpacking, charging devices, getting food, repapcking, checking out etc. That can take a surprising amount of time, though it may get you a nicer bed, bath and room. This is particularly true on the "roaming" road trip, where at high season you can find yourself hunting a room near the end of your day and finding no rooms are available for miles. That's less often true for campsites. The RV has big downsides, though. You're living in a tiny cramped space with quite limited bathroom and cooking facilities. And it's a pain to drive, and impossible on things like narrow European village streets and roads. It's more doable in the places like the west of the USA and Canada. A living space unit could even be for temporary rental -- effectively a roving motel room. This might not have the convenience of an RV in not packing and unpacking, but could make sure that housing is always available, even in locations that have none like parks. Let's consider what you might see in the sightseeing and travel car, rather than sleeping vehicle. 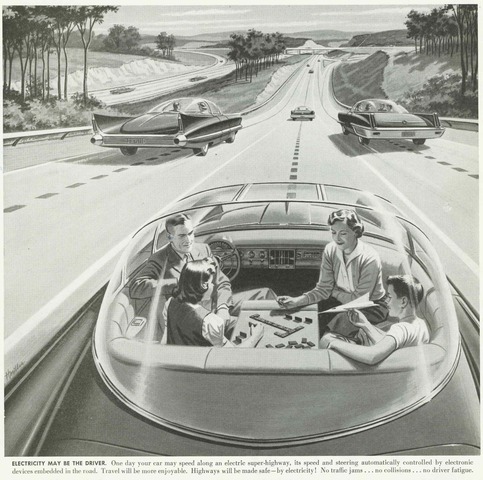 Science fiction depictions of cars of the future often display a "bubble" car with a giant domed window. A real commuter and city travel car is unlikely to need that, but tourists might like such giant views, especially if combined with LCD panels that can dim sections in the sun. Keeping such windows clean will be a challenge, but a robocar can zoom off to a car wash when it's not in use to keep it clean beyond what the wipers can do. In popular tourist zones, car washes -- or even car washing robovehicles -- might be common to get this done. In nice weather, an open top car might be a popular choice. This could be a "convertible" but once again, robocars offer the option of visiting a depot for service, including things like removing and adding a hard top based on the weather forecast. A group car might offer face to face seating which is nice for socializing and parties, though many people don't want to ride backwards for sightseeing. Rotatable seats could be a useful feature for all -- though that makes safety systems like airbags a challenge. Nice speakers are a must -- music can come from the occupant's own devices. Charging for those devices will also be a must (as it will be in almost all vehicles.) There is one exception -- some tours might come with music synchronized to the location and motion. Imagine that as your car brings you up over a ridge to a dramatic new view, it plays synchronized dramatic music, much as you might see in a movie "reveal." While tourists want to use their own cameras, and will want portals in the windows to be able to photograph while inside, chances are a tourist car might come equipped with its own external cameras (still and video) either in all directions, or pointed at what the car knows are the popular tourist spots -- or where the occupants are looking. While most riders in ordinary cars won't want surveillance, tourists are constantly shooting selfies, so internal camera could deliver video or stills of the occupants in front of the popular tourist scenes (possibly combining inside and outside views to make an image as though the windows and top were not there.) Today's reality is people who are not serious photographers prefer a picture of them at the Grand Canyon to a picture of the canyon. The shots could be curated based on location and AI tools detecting when the occupants were posed in good positions -- or could be triggered by voice, hand gestures or smiles. The video would be written only to a memory card of the occupants, or fed live into their private devices, and physically not available to the car company. Of course pictures could also be provided of the sights visited shot by professionals, but that's like a postcard and people prefer an image shot as they were there, featuring them, and triggered by them. And yes, the car could even come equipped with a drone able to take shots of the people in their car, or as they leave the car and wander the sites. (Though we need to find a way to stop every location from being full of drones following each tourist to capture their experience.) Again, all just loaded into a memory card belonging to the tourists, for privacy protection. All these images could be loaded into software that, knowing the route, produces a great edited souvenir video and still collection, merged together with the shots taken on people's handheld cameras. Regulation might require the cars to be painted in dull or camo patterns for the terrain they will visit, to spoil it less. For a road trip, augmented reality, projecting information in the windows of the car, could be more than the gimmick it usually is when put into cars. Tourists do want to know what they are looking at, and reading is much more effective than listening sometimes. I think tourism could be one of the major applications of AR, both in tour vehicles and even while walking around. While most people resist having to wear any sort of headgear in their everyday life, when out on a walking or driving tour it can make sense. In fact, broadly, most of the things I have seen proposed for future cars which are far too much of a gimmick for a regular commuter's car suddenly make sense for the tourist. I'm imagining a network of service stations made specifically for tourist roboRVs, with cafes and bathrooms where you can take a shower. While you're doing that, someone can pop into your RV, make the bed, clean everything, restock the fridge, recharge the vehicle, leave some goodies, etc. It'd be a very fast process because all the RVs will be standardised. This would be a good additional source of revenue for the operator and provides essential services for the tourist. It also makes the RV lighter and cheaper since having a shower and a whole bunch of spare 'stuff' is quite expensive. People don't like to move all the time because you must secure everything if you are going to move. Everything must be put away, blinds and drapes secured, etc. etc. Though if you are already moving, one could imagine having an RV "dock" where the RV auto-docks the door against a small building which has full showers and bath. The key thing is you only have to dock for 25-30 minutes for many people, which means each dock could serve several RVs per morning. You would rig for motion, it would dock at your reserved time, and off you go. No time to clean the dock unit though which could be a problem. You could have docks that you stick with all night -- but those would start approaching a hotel room in cost since they need lots of land, and they need cleaning, just not of the bed and sheets. However, the nightly dock, even at near-hotel prices, could be attractive to tourists who like not having to pack and unpack but gain the advantages of a real bathroom, real kitchen and some extra sitting space but travel in a smaller, cheaper RV. This is particularly true in Europe. In Europe your choices are a very tiny RV that is effectively converted entirely to sleeping at night and is cramped, or a slightly larger RV that can't go into inner cities or park in many places. Even the small one is almost impossible to park in usual places or get down certain streets. Totally agree that people would want toilets in an RV. I'm not familiar with the relative difficulties of toilets vs. toilet + shower, but I'd have thought you'd saving some money and maintenance costs.